The Dominican Republic occupies half of the island of Hispaniola - the eastern half is Haiti. Although famous for its beaches, the Dominican Republic is also home to the Caribbean's highest mountain: Pico Duarte. The island lies between Jamaica and Puerto Rico. To the south of the Dominican Republic is the Caribbean Sea and to the north the Atlantic Ocean. Winds are generally northerlies or westerlies, meaning that the southeast of the island is typically sheltered. Water temperature is warm on both sides of the island throughout the year. It ranges from 24 oC in winter to 27 oC in summer. You can dive throughout the year. In winter the best diving is on the Caribbean side; in summer the Atlantic coast comes into its own. The Dominican Republic has a long coastline and many dive sites. As well as the coral reefs, cave and cavern diving abounds. In addition many wrecks surround the island. Punta Cana is the most popular diving area. It is good for beginners and has some enjoyable wrecks. Experienced divers - unless you are looking for cave diving - would be better going elsewhere. 56 miles north of the Dominican Republic is the Silver Bank. This protected sanctuary sees the entire North Atlantic Humpback Whale population arrive this breeding and calving area each winter from January to April. You can swim and snorkel with the whales from a liveaboard boat. The official language is Spanish, but English is widely spoken. US dollars and Euros are accepted as well as the local pesos. There are two recompression chambers in Puerto Plata and Santo Domingo.
" Lots of great fish and rock formations "
"Many different fish, perfect water, great!" "The best in Sosua, good value for money, only 5 USD for the boat and you can get tanks and weight for 10 USD for one day! There are good hotels in the area but don't use the all inclusive." The eastmost point of the Dominican Republic, where the Atlantic and the Caribbean meet. The Monica is a shallow shipwreck suitable for beginners but also interesting for experienced divers. The Monica hit the reef whilst carrying train tracks. 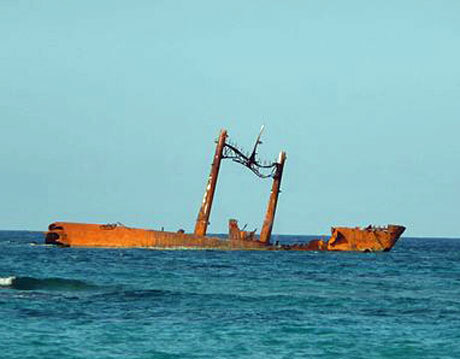 Close to the Monica, this Russian freighter broke in two on the reef in 1978. The bow is above the water and the wreck stretches down to 16 m.
The St George was deliberately sunk in 1999. It's intact with swim-throughs and a covering of sealife. Catalina island is just 1.5 miles from the southeast of the Dominican Republic mainland. Cruise ships sometimes visit and it can get crowded underwater. "Beautiful corals, sponges and numerous types of marine life. " "Beautiful dive site starting at about 15 feet and descending down to more than 130 feet. Myriad sponges, corals and fish life. " " There are so many dive sites near this resort area. It's hard to describe just one. However, the Nursery and Metro are must visit sites. " La Caleta is a marine reserve near Las Americas International Airport. It features wrecks, reefs and walls dropping down 180 m.
" Just at the airport bypass. This is one of the Western Hemisphere's first marine national parks. The Limon, a 40-ft vessel was sunk here for reef protection and diving. " " A naturally grown coral reef with a perpendicularly tapered steep face at the north side "
"A naturally grown coral reef that looks like a garden.You can find a lost diving boat there, too. " "A coral reef with the shape of a huge underwater mountain, where Baracudas are frequently observed. " "Some very healthy and pretty reefs with fish life but zero pelagic. A tourist factory that has driven large stuff away. Ok for practising photos but not a serious diving destination." "Not worth visiting for diving. Very little to see and the dives all the same. " "In response to the above comment I must disagree, we have dived in a variety of places around the island and have found the diving to change drastically between the different areas. The North Coast has great diving for the beginner to intermediate divers (5-34 m), there are also a number of places for cave diving, the South East has a large number of wrecks and very interesting dive sites including Saona, Catalina and Catalanita where you can see sharks, morays, rays only to name a few. " "We had six very enjoyable dives in early September with Gri Gri Divers at Rio San Juan. Plenty of colourful coral and a fair amount of fish / crabs etc." "Great food, great people, great diving and dolphins brilliant. " "We are a professional and friendly full service dive center offering our guests a full retail selection of equipment and accesories, all PADI courses, Sosua Bay diving/snorkelling, Dive Safaris along the North Coast including the "El Dudu" Caverns and an incredible liveaboard service to Paradise Island for some world class diving. If you are looking to go pro, inquire about our Elite Internship Program or see our website for more details. English, French, Spanish, German, Swedish, Finnish and Danish spoken." Dive 18 dive sites. Speak English, Italian and Spanish. "Discover Scuba Diving in the warm Caribbean waters of the Dominican Republic with the best of the North. Combine and create your ultimate Scuba Diving Holiday Adventure for a perfect dive vacation. Just tell us what you want and we will make it happen. You want to Snorkel? We offer Snorkeling trips and snorkeling Cruises. An aquatic adventure for the whole family or Special charters for that Very special Someone or Special Occasion. Revel in the casual Down-Island pace of life while Diving, Snorkeling or just Relaxing between dives on one of our Beautiful White Sandy Beaches. " Scuba diving center, PADI courses, scuba diving tours and snorkelling trips. Offer many certifications including cave and cavern diver. "Mark Goldsmith and his team are not only top-notch professionals in terms of the care they give students, beginning divers, experienced divers, etc. they also firmly believe in protecting the environment. You will often see the SDDS dive leaders picking up trash left behind by less-eco concerned water enthusiasts. They know their stuff and are always ready to point out interesting formations, life forms, etc. We used a couple of other dive shops the Dominican Republic and were not impressed with the service or willingness of the dive masters to point out interesting sites. To them we were just dollars, not divers wanting to see and learn. Mark Goldsmith, the owner, has been a dive instructor in the Dominican Republic for about 12 years. He is well known and respected in the industry. " by Michael Grosberg, Kevin Raub. 256 pages, 64 pp colour, 37 maps. Dimensions: 128mm x 197mm. by Lubos Kordac. A compendium of historic shipwrecks surrounding Hispaniola - with their history, locations, maps, photos and drawings. Also tells about pirates like Cofresi and Morgan, and about the treasure hunters. by Ewald Lieske, Robert Myers. An excellent fish identification book. by Paul Humann, Ned Deloach, Les Wilk. Nearly 1200 photographs showing 900 species. Please send us your comments on Dominican Republic. Do you want to recommend a diving centre or dive site? Let us know. Have a question - we're waiting to hear from you.